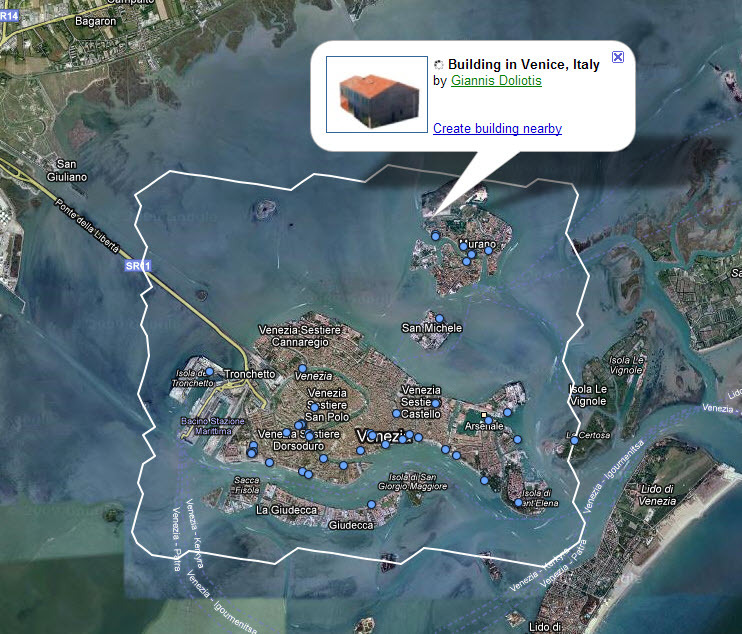 Today, we released an update to Google Building Maker that contains a few improvements we think you'll like. When viewing one of the available locations in Building Maker, you'll notice that a number of blue markers appear on the map. These markers are visual indicators where buildings have recently been modeled. We introduced them to help prevent collisions where multiple people are modeling the same building and to enable users to see where active modeling is occurring. Since the blue markers only represent recent models, it's always a good idea to view a building with the "Earth" button prior to modeling to ensure that one doesn't already exist. You'll also notice that the blue markers are clickable. If you click one, it will display a pop-up that identifies the name of the model and its author. The pop-up also contains a "Create building nearby" link, that switches the view to the "Editor" mode where you can begin modeling. If you happen to be the author of that building, it will also contain an "Edit this building" link. As a reminder, if you see a city that contains a blue boundary, don't let that stop you from modeling there. If you publish a model of equal or greater quality (more detailed) than ours, we'll replace it. The other benefit of publishing Building Maker (or SketchUp) models where existing auto-generated models from Google exist, is that you can attach metadata (address, description, etc) to them, thus making the new building clickable. Last but not least, you'll also notice that two new cities were added to the list: Milan, Italy and Miami, Florida. Happy modeling! No sign of buildings already constructed and the lack of preview in the BM created a small problem. Search for such a model in 3DWH it has not been easy. Good news!